50% off Costumes! Fall Clearance Up to 60% Off! 25% Off Outerwear - Children's Place! Use code: Y7E2011 for an EXTRA 15% Off!! LOTS of girls costumes - includes online only styles! LOTS of cute girls costume accesories! LOTS of boys costumes - includes online only styles! LOTS of Halloween graphic tees! Free Shipping on any order. No code required. Valid thru 10/3/11. 6pm Deals! Etnies, Supra, DVS up to 80% off! Roxy up to 75% off! Skullcandy! Dansko up to 65% off! 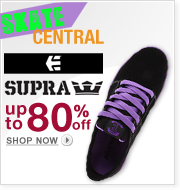 Etnies, Supra and DVS up to 80% off! Roxy up to 75% off! Canterbury of New Zealand and Robert Graham up to 75% off! 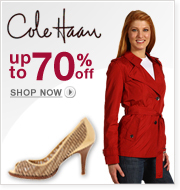 Cole Haan up to 70% off! Skullcandy up to 50% off! DC select styles $29.95 or less! Fiskars - 2 Pair for only $6 Shipped! Total Price: $5.99 + FREE Shipping! Great for camping or 72 hour kits! Scrubs Top & Bottom for $20! You can add additional tops or bottoms for $8 each!